Introducing the New Kollmorgen P5000 Stepper Drive. The P5000 is a compact micro-stepping stepper drive optimized for high system performance with Kollmorgen's industry leading POWERMAX II stepper motors. 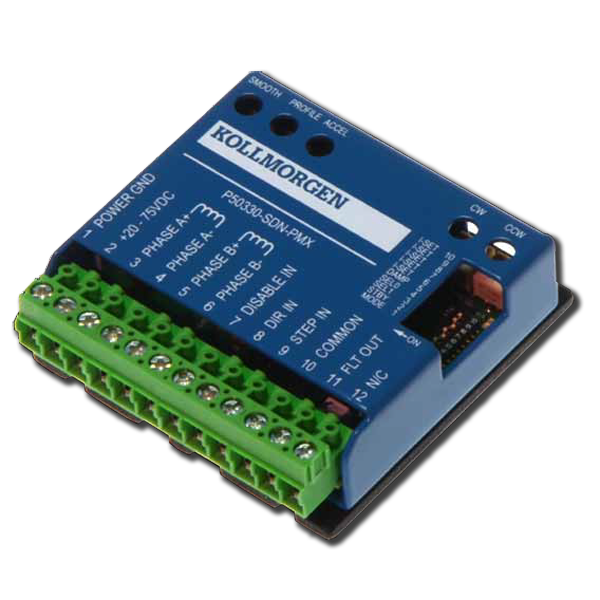 It is an impressive yet simple addition to the Kollmorgen stepper drive family. Pairing a stepper system doesn’t get any easier! The P5000 and Kollmorgen stepper motors are meant to be together. With easy access smoothing and profile potentiometers for optimized performance. Wave matching via potentiometers for Kollmorgen motors to provide optimal performance for the Kollmorgen Stepper Motor Families. VCO allows for velocity control via 2 seperate potentiometers for CW and CCW rotation and a third potentiometer for acceleration.